Yep, its another Monday, with a fabulously sunny and warm week predicted. Today I go to the mountain and clean. I needed some positive vibes today as I really wanted to paint! Enjoy yourself, I hope you find it inspiring to visit. Those tulips are beautiful! We need to plant more bulbs so we have more for next hear. Thanks for sharing. Pamela, those tulips are gorgeous. I could look at them forever. Happy Pink Saturday. I am so glad you joined us today, and I hope you will be back often. 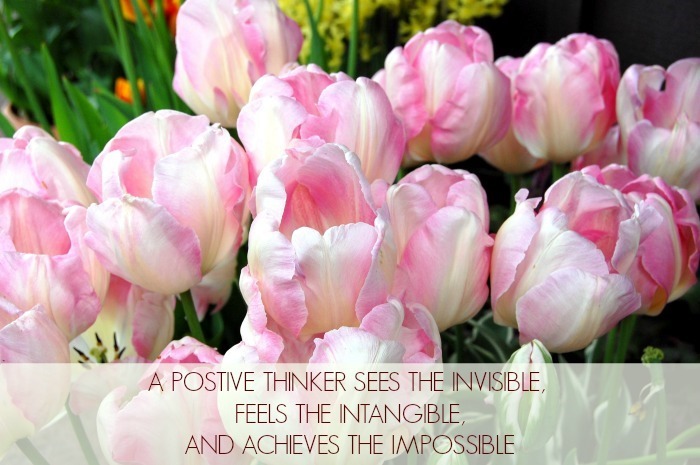 I am a long time and firm believer in the power of positive thinking. It has served me well for many years. Being positive is the only way to go. I try to share as much as I can on Pink Saturday, pink is such a Positive color.